Makeup artists seem to live the ultimate glamorous and glitzy life. With opportunities to travel all over the world, work backstage on models who walk the runway, apply makeup on the faces of famous celebrities and many more, becoming a professional makeup artist seems relatively easy and straightforward. However, there’s more to it than simply booking clients and showing up at the right location and time. The journey to becoming a successful professional makeup artist is not effortless; it takes an unbelievable amount of hard work and perseverance to achieve the level of expertise that most people are looking for in a makeup artist. Unknown to many, beneath all of the different colors and makeup products reveal an artist who had to sacrifice many things in order to bring out the natural beauty of others and help them to feel confident everyday. After going through countless hours of practicing, makeup artist don’t start their career the instant they graduate and receive their certification. Below are some situations that you may run into when first starting out as a makeup artist. Although these will most likely happen, they should not discourage you from pursuing the career that you are passionate about. Pushing through will make it all worth it in the end! It’s never that easy. But just because it may seem challenging doesn’t mean that it’s unattainable. Even though it might take longer than you had originally planned, there’s not doubt that you’re going to make it. All it takes is persistence and a little bit of patience. Much like internships, you may have to work for free at first in order to gain the necessary experience. Although there may not be a lot of paying opportunities, you will learn many skills while being on-the-job. You may have to exchange your services before you are able to start charging others. Nevertheless, you will have the chance to build and add to your portfolio, and you may even have the opportunity to have your work published either in print or online. This will make you seem as a more credible artist and you will soon have clients asking to book you. As much as this sounds like a dream, working as a freelance makeup artist can be quite difficult. Although you get to set your own schedule, sometimes that may be because you might not have many bookings coming in. Yes, it can be wonderful to have as many rest days as you want, but rest days also mean no projects or clients; which leads to less income being generated. But you can make the most of your free time by networking with professionals in the same industry. Making connections with photographers, models and other professional makeup artists can lead to invaluable opportunities to help you achieve your career goals. It’s always important to remember that networking doesn't just serve you, but is a mutually beneficial activity. You never know when your skills and resources can prove to be helpful to others in your professional circle. If you’re not looking to work the typical 9-5 desk job, then having a career in makeup artistry may be your calling. However, this doesn’t necessarily mean that you’ll have an easy schedule. In fact, you may have to sacrifice a whole day or two depending on your client or project. 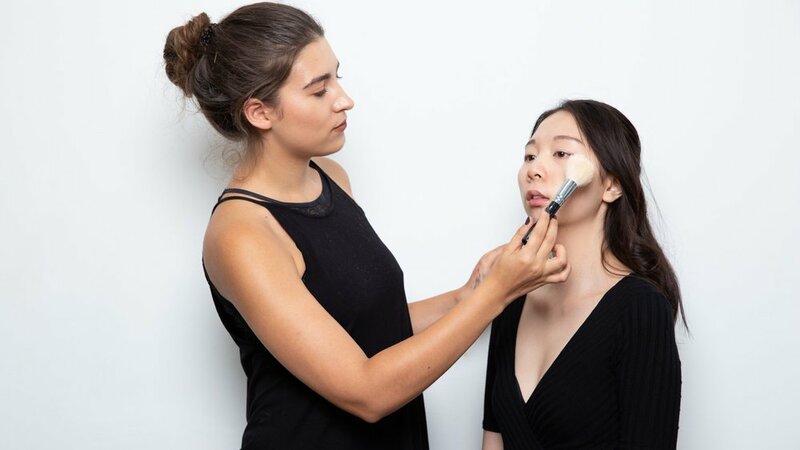 Due to special occasions or demanding clients, you may have to start the makeup process way before the event starts, and you may even have to stay all the way until the end. You may have no choice but to go along, as it can hurt your reputation to say no. When you are booked by a client, they are putting all of their trust in you to deliver a look that they will fall in love with, which can be quite nerve-wrecking for you. As you go through the makeup application, clients may question your choices and put a lot of pressure on you. Sooner or later, you’re going to run into some difficult people. Some will be easy to please, while others may be more high-maintenance. In the end, they will all end up expecting nothing but the best from you. It doesn’t hurt to ask your client what their preference is. Do you want to get out and see the world? Many people do, and a career in makeup artistry may offer just that. But there are always some cons to every situation. It can be tough having to travel longer than you would spend the time to finish your actual work. You may get to travel to some amazing cities, but you might not even have the time to explore. Traveling through different time zones can upset your sleeping schedule, making it difficult to concentrate. However, if you’re willing to go the extra mile, your wanderlust could serve you well as your adaptability will build up an impressive reputation. You can make good money out of being a makeup artist, but this is usually after you have built up a clientele as well as other factors such as: your location, if you are able to do both hair and makeup, and your years of experience. As mentioned before, getting to a point where you can charge more for your services may take some time, but the amount you charge should reflect your talent as an artist. This means that you can never practice enough in order to get to where you need to go! Because you are a professional, you expected to have an array of high-quality makeup products. You know this by now, but makeup can be very pricy. You are also expected to know all the techniques behind creating a great look - both old and new. This is why attending a makeup school to amplify your knowledge and techniques, get a diploma to be certified, and lastly, get that generous discount to constantly update your professional makeup kit. Nina Mua gladly offers all these services for aspiring makeup artists. Despite all of these points, they should not keep you from doing what you want to do in life. If things get a little bit hectic, remember to take a break. That’s one beauty of being a freelance makeup artist; you are in control of your time. Don’t give up! Your determination will pay off, and you’ll find that being a makeup artist is both liberating and rewarding. If you are looking to become a professional makeup artist, visit our website for more information.